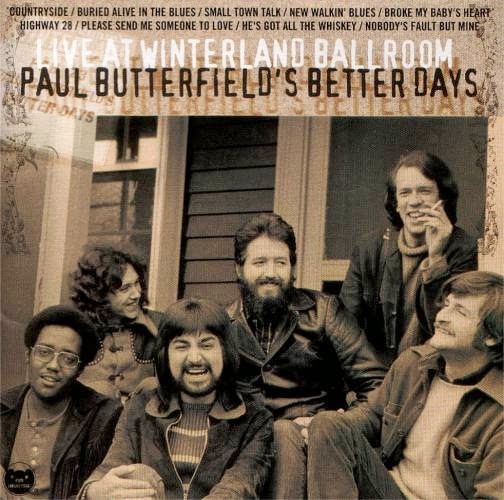 Better Days was a short-lived band led by harmonica player Paul Butterfield. Better Days were only around briefly, and only ever released two studio albums. Fortunately in 1999 an excellent live album was released, taken from recordings of a concert at Bill Graham's Winterland Ballroom in San Francisco in 1973. It's a great quality recording, showing the talented band at their best, with lots of the songs featuring extended solos and jams. The majority of the set list is made up of numbers from the band's two albums, but it also features an otherwise unreleased song ("Countryside") and a fifteen-minute jam of Bobby Charles' "He's Got All The Whiskey" (the song originally appeared on Charles' 1972 self-titled album, which members of Better Days had played on).